The historical site marker explains: "There are few bank buildings in America which equal this in permanence and quality of construction..." remarked architect Arthur Zimm. 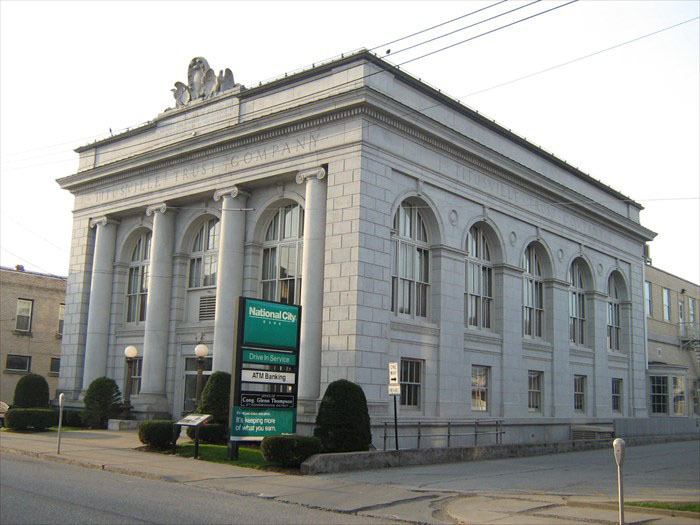 The Titusville Herald reported in 1919 that "...few were prepared for the beauties revealed when its doors were thrown open..."
The building featured specially selected types of marble, cork floors for the tellers, broad windows to "provide the best of ventilation," and a vault "equipped with every known burglar proof and safety device." Alfred Valiant painted the ceiling mural showing oil industry history around his memorial portrait of Edwin Drake. The basement housed a tonsorial parlor (barber shop), locker rooms, ice-making plant, fur storage room, elaborate chandeliers, manicure and hair dressing rooms, and public bath parlors. James Curtis McKinney, former head of the Titusville Iron Works, founded the Titusville Trust Company and served as its first president. “Titusville Trust Company,” NW PA Heritage, accessed April 26, 2019, http://nwpaheritage.org/items/show/42.